Many people facing imminent retirement must make a choice of receiving their pension benefit as an annuity or taking a single lump sum payment instead. If a pensioner chooses an annuity he will receive a monthly income for the remainder of his life. The choice is irrevocable. This is an important decision and investors should consider seeking help from a qualified professional such as a Certified Financial Planner (CFP). 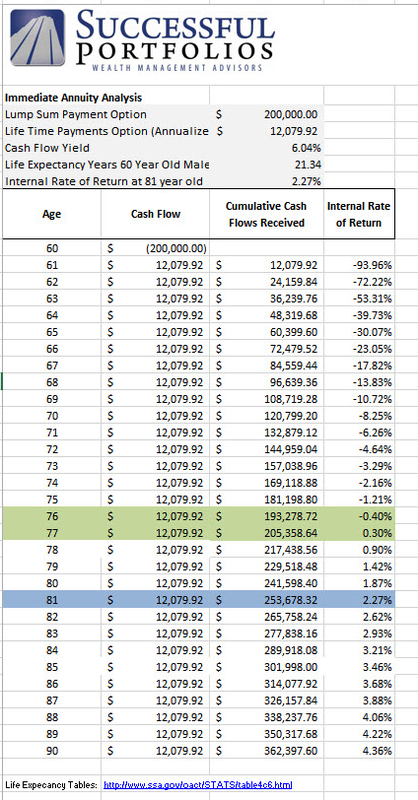 So what is the rate of return on a given lifetime fixed annuity? The answer depends on the amount of money you must invest upfront, the amount of income you will receive annually, and how long you will live. A recent issue of Barron’s listed several top picks for lifetime income annuities as shown in the table below. You can see in the table that for an upfront premium of $200,000 Principal Financial will pay a 60 year old male $1,066.66 per month for the rest of his life. The “percentage paid on investment” is 6.04%. But that is not the whole story. What also matters is the internal rate of return on investment. You can make that calculation with Successful Portfolios handy Pension and Annuity Rate of Return Estimator. 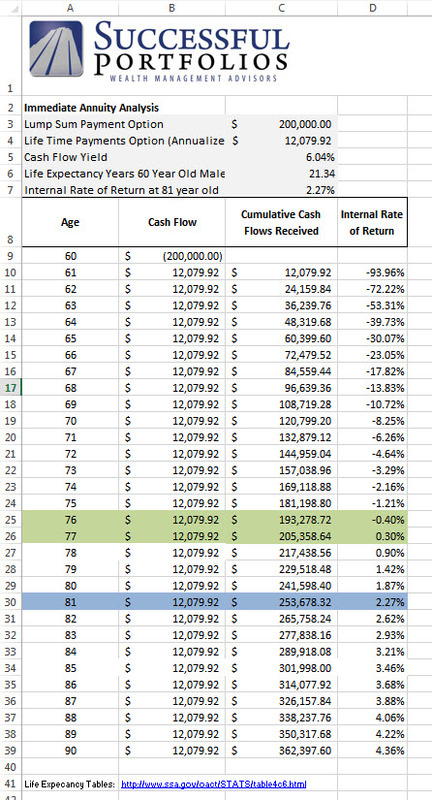 You can see in the estimator worksheet shown below that the internal rate of return on the annuity in question is 2.27% assuming the investor lives to 81 years of age. That is considerably less than the 6.04% “percentage paid on investment”. In fact we can see the investor must live to 77 years of age to have a positive investment return on his annuity purchase. Call the professionals at Successful Portfolios. We can help you evaluate the investment return on your lifetime annuity or pension.